To discuss this version of M.U.L.E., please use this topic in the WoM forum. The quickest way play the game is to make use of the Archive.org C64 software library. 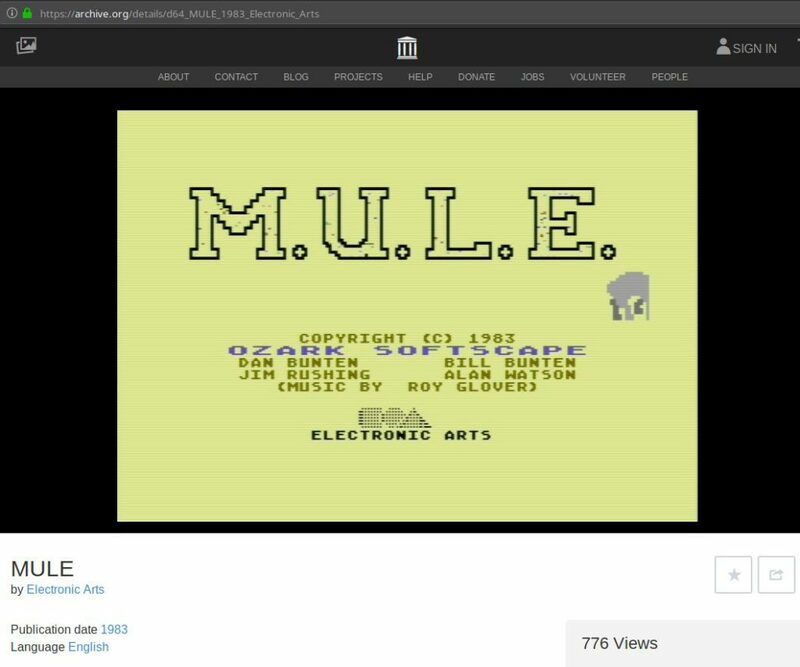 Archive.org hosts a web-based C64 emulator running directly inside your internet browser. However, you can’t use a joystick (or even four), so you have to play with the keyboard. Also – good for the PAL country fans, bad for the NTSC country fans – the emulator runs with PAL speed. So e.g. all U.S.-based fans will feel the game runs too slow. a version of M.U.L.E. from 2011 which adds support for the C64 four-player adapter, attached to the C64’s user port. With this version, you can play M.U.L.E. on the C64 like on the Atari 400/800 – with four joysticks! Emulating C64 M.U.L.E. on modern PCs. Even online play is possible, if you are a bit versed in computer and network administration. Gameplay & gameplay comparison with Atari/Commodore M.U.L.E. MobyGames entry for C64 M.U.L.E. C64 Wiki entry for C64 M.U.L.E. Lemon64 entry for C64 M.U.L.E.